Tokyo and Osaka are ruled by governors rather than mayors. Governors are elected to four year terms. As part of the effort to reduce the cost of government, the Koizumi administration cut the number of towns and villages in the early 2000s by incorporating small towns and villages into large ones, assuming that spending would be handled more efficiently by larger towns and cities. To get local mayors and council members to vote themselves out of office they were offered generous buy outs. The merger of villages and towns, known as Heisei no Daigappei has dramatically reduced the number of municipalities in Japan from 3,231 to 1,821 as of March 2006. Hundreds of small towns and villages have become parts of big cities. Many municipal governments rely on the central government for 70 percent or more of their funding. In turn local governments are expected to pitch in on national projects such as highways, dams, bridges and trains that benefit them. Local autonomy also increased in the early 1990s when prefectural governments were encouraged to spend more money to counterbalance the collapse of the bubble economy. As a result local governments have become powerful and won more control over local projects and corruption involving local officials has increased. Money is often wasted on unnecessary things, In a 2002 event organized by a local politician, former U.S. President Bill Clinton was paid $400,000 by a local civic group to speak before a youth group in Mito City in Japan. For that money addressed 1,700 high school students, posed for pictures at a reception, attended a banquet and met with college students the next morning. Misuse of funds is common at the local level. Making fake purchase orders for stationary and desk items is a tactic commonly used because such items are difficult to account for. Local governments are typically allowed to purchase items with a discretionary contract if their purchase is less than $10,000. In Aichi Prefecture, local officials created a $660,000 slush fund using such methods..
Salary levels of staff such as drivers and security guards, are higher in local governments than in the private sector. According to the ministry's data, the salary levels of cleaning staff and bus drivers are about 50 percent higher than those in the private sector, while the salary levels of security guards are about 90 percent higher. In recent years there has been a drive to decentralize power from the central government to local governments and one the biggest steps to making this happen is freeing the local government from the burden of financing extensive public works projects such as dams, expressways and Shinkansen rail lines dreamed up by the central government. Large government projects, the central government pays two thirds and local governments pay a third. The system was set up under the notion that people who benefit from projects should pay for them. 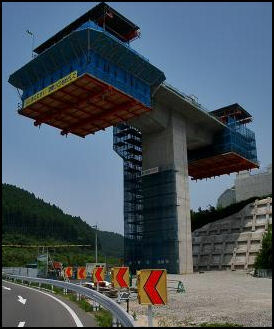 But in many cases the costs of projects outweigh the benefits. The Niigata prefectural government said it may defy a request by the central government to increase its spending on a Shinkansen project by ¥22 billion, arguing it would be too much of strain to come up with the extra money. Yubari is an infamous town that tried to revitalize itself after a coal mine closed in the 1980s by attempting to turn itself into a tourist attraction by building an expensive amusement park, a robot museum and other poorly thought-out tourist attractions with municipal funds. Few tourists came to the town and the result was huge debts and the bankruptcy of the town. In the 1960s, Yubari was a prosperous mining town with a population of 120,000. By the early 2000s, it was saddled with $500 million in debts, which worked out to about $40,000 for each of the town’s’s 12,828 inhabitants. In 2006, the local government consolidated 11 schools into four, cut back on snow removal, closed libraries and museums, raised taxes, began charging hefty fees for water and sewage and made other changes to pay back the debts. About half of the town’s 300 municipal workers were laid off and the those that stayed on had salary cuts of 30 percent to 70 percent. The cuts was so thorough and severe that the toilets in Yubari station were closed, forcing those in need to use a hotel next door, and the hospital-turned clinic could no longer offer things like kidney dialysis, forcing people who needed such treatments to go elsewhere or die. Not making matters any better as Yubari looks ot the future is the fact that 40 percent of the town’s residents are over 65 and 8 percent is under 8, making Yubari the most aged town in Japan. Experts are watching what is happening in Yubari and see it as test of how much or how little Tokyo will help Yubari out and how the precedent would affect other towns in financial trouble. 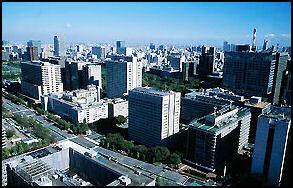 Many blame Tokyo for creating the situation by giving out too much money and soft loans. Text Sources: New York Times, Washington Post, Los Angeles Times, Daily Yomiuri, Times of London, Japan National Tourist Organization (JNTO), National Geographic, The New Yorker, Time, Newsweek, Reuters, AP, Lonely Planet Guides, Compton’s Encyclopedia and various books and other publications. This site contains copyrighted material the use of which has not always been authorized by the copyright owner. Such material is made available in an effort to advance understanding of country or topic discussed in the article. This constitutes 'fair use' of any such copyrighted material as provided for in section 107 of the US Copyright Law. In accordance with Title 17 U.S.C. Section 107, the material on this site is distributed without profit. If you wish to use copyrighted material from this site for purposes of your own that go beyond 'fair use', you must obtain permission from the copyright owner. If you are the copyright owner and would like this content removed from factsanddetails.com, please contact me.